Scott Carter scored for Yaxley against Newport Pagnell. Stamford AFC pulled off a great comeback to force a 2-2 Evo Stik Northern Premier League draw at home to Stourbridge today (January 9). The efforts of the club and its fans to get the game on after heavy overnight rain looked to be in vain when the visitors - who are managed by former Posh player Gary Hackett - went 2-0 up just past the hour mark. Matt Gearing (blue) scored for Yaxley against Newport Pagnell. But an own goal within three minutes dragged ‘The Daniels’ level and Chris Hamilton found an equaliser in the fifth minute of stoppage time. That’s four points in their last two home games for Graham Drury’s men, but they remain next-to-bottom, three points from safety and having played several more games than most of their relegation rivals. 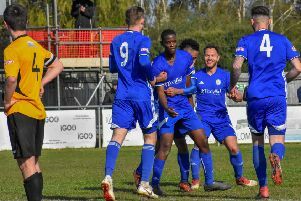 There was also some welcome joy for Spalding United in Division One South as they ended a five-game losing streak with a 1-0 home win over play-off rivals Romulus. Kieron Davies scored the only goal of the game for ‘The Tulips’ in the sixth minute of his debut. Marcus Ebdon’s men remain fourth in the table. Yaxley’s home game with Newport Pagnell on the artificial surface at In2itive Park was one of the few at this level to survive the wet weather. The Cuckoos took full advantage to win 2-0 thanks to goals in the first 25 minutes from Matt Gearing and Scott Carter, Jon-Paul Duncliffe created the opening goal for Gearing with a strong run down the right wing and accurate cross before Carter headed in Jon Stead’s free-kick. Yaxley move up to eighth in the table after a fine win against the team in third place. Waterlogged pitches caused the postponements of United Counties League games involving, Holbeach United, Deeping Rangers, Peterborough Northern Star, Huntingdon Town, Wisbech Town and Bourne. Peterborough Sports’ Northants Junior Cup quarter-final at Northampton ON Chenecks was also called off. Peterborough Premier Division side Netherton beat United Counties Division One side Wellingborough Whitworth 4-3 in the same competition. March Town’s Thurlow Nunn Division One match at Needham Market was also postponed.